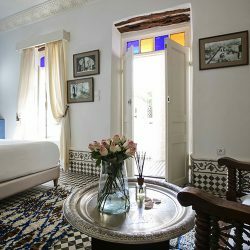 This intimate suite decorated with the Mogador blue is appealing and elegant. 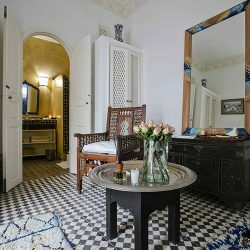 Get back to the timeless notions of aesthetics and elegance while staying in the Mogador suite. 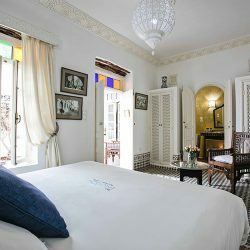 An atmosphere in the colors of Essaouira that emulates the palette of bright blue doors, windows and balconies of houses and riads that punctuate the alleys of the medina. 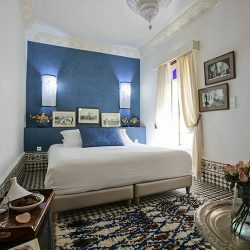 You will also find the blue sky of the Cité des Alizés, incomparable Mogador, and that of the ocean at a time when the sun is at its highest. 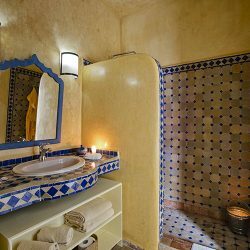 This suite is invigorating, luminous and tastefully decorated in an authentic and sober style allowing for full relaxation.